Eric Rasmussen moved to Eau Claire before fourth grade and he hasn't left since. He attended the University of Wisconsin–Eau Claire (UWEC), then got a job as an English teacher at Memorial High School. He even bought the house he grew up in from his parents. He earned an MFA from Augsburg University in Minneapolis, and his work has appeared in various publications, including Fugue, Sundog Lit, Gulf Stream, Pithead Chapel, South Carolina Review, and extensively in Volume One. Visit theotherericrasmussen.com for more. Kate Hinnant’s first year in Eau Claire was the worst of her life. She had pneumonia three times, fractured her vertebra, and even died for a minute. But she doesn’t blame the city. Since 2002, she has taught in the English department at UWEC and now serves as a professor of research and instruction in McIntyre Library. She studied anthropology at Cornell University, and then got an MFA at Purdue and a master’s in library science at the University of Illinois. While at Purdue, she served as poetry editor of Sycamore Review. She has poems published in New England Review, Cimarron Review, and decomP magazinE. Her life is made possible by her twin tweens, Sally and Leo, and her husband who teaches film and theory at the university. Charlotte is a teacher and PhD student in English at the University of Nebraska-Lincoln. She’s also a proud two-time alum of the University of Wisconsin-Eau Claire, where she received a BA in English and political science and an MA in writing. Her creative writing and book reviews can be found in Pleiades, The Los Angeles Review, and The Madison Review. Carrie Butler Becker came to Eau Claire in 1994 for college, and she never left. She has worked at UW-Eau Claire for over 20 years and currently serves in the McIntyre Library Acquisitions department (i.e., she buys the books!). She’s an avid reader, finishing 180 books each year, which she reviews on her website. She has published locally and nationally, and she met her husband when he read a piece she wrote for Microsoft. Their long-distance online meeting (and proposal outside the public library) has turned into a 17-year marriage. Jessi Peterson moved to the Chippewa Valley the summer before 3rd grade, arriving just in time to miss the famous 1980 storm. She is a children’s librarian in Chippewa Falls and her favorite days of the week are storytime days (Tuesdays and Fridays, 10:30 and 11, join us!). She loves reading and singing and acting silly, all in the service of growing the next generation of readers. She also loves to be out in the woods or on the river in a kayak, which is why her (fabulous) husband is building a treehouse where she can write in the woods and look out over the river. For several years she has served as co-leader of one of the Young Writers Workshops during the Chippewa Valley Book Festival and is a member of the Poets of the Oak Lair, a local poetry workshop group. Her work has appeared in Wisconsin People and Ideas, Sky Island Journal , the Local Lit column of Volume One and the inaugural issue of Barstow and Grand. Ashly Curtis was born and raised in the Chippewa Valley. She graduated with a degree in English-Creative Writing from UW-Eau Claire in 2013 and has been desperately trying to figure out what to do with that degree ever since. She’s currently the textbook manager at the UW-Eau Claire campus bookstore. Having finally embraced the fact that she might actually be a poet, Ashly has joined local poetry group Poets of the Oak Lair and published pieces in twig and Barstow & Grand under pen name Ash Lee. If she’s not writing, you can find her attending Chippewa Valley Writer’s Guild events, reading for one of three book clubs she’s in, or playing with her dog Clementine. Deb Peterson writes literary, mystery, and speculative fiction stories under the name Delaney Green and is the author of historical fantasy novels about Jem Connolly, an 18th century girl with magical Second Sight. Peterson has worked as a reporter, a copy editor, a professional actress, a Broadway theater concessions manager, a farm laborer, a school bus driver, a high school English teacher, and a college writing coach. Her work has appeared online, in anthologies and journals, and in magazines and newspapers, including Barstow & Grand. She lives in Eau Claire. Rachel Esselman is an editor living in downtown Eau Claire with her Chihuahua mix, Hamilton. She attended UWEC, double majoring in English rhetoric and psychology and also participating in the literary selection process for NOTA. She believes everyone has at least one good story to tell, and hers was published in UW Barron County's Red Cedar. When she's not busy trying to meet her Goodreads goal of 150 books, you can usually find her (and Hamilton) at the dog park. B.J. Hollars is the author of several books, most recently The Road South: Personal Stories of the Freedom Riders. In the fall of 2019, his forthcoming book, Midwestern Strange: Hunting Monsters, Martians and the Weird in Flyover Country, will be released. Hollars is the recipient of the Truman Capote Prize for Literary Nonfiction, the Anne B. and James B. McMillan Prize, the Council of Wisconsin Writers' Blei-Derleth Award, and the Society of Midland Authors Award. He is the founder and executive director of the Chippewa Valley Writers Guild and an associate professor of English at the University of Wisconsin-Eau Claire. He lives a simple existence with his wife, their children, and their dog. Lindsay Hein first heard of Eau Claire from her parents who met at the university as communication and journalism students working on The Spectator. Following in their footsteps Lindsay is currently working towards a degree in Communication Studies and Creative Writing. At UWEC Lindsay works for the campus TV station, writing, directing, and editing videos with her team. Besides that she writes short stories and sketches in her free time and is looking forward to joining the ever-expanding guild of writers in the Chippewa Valley. Sarah Jo is an artist in the Eau Claire community. Using the feminist revolution as her muse, she collages, photographs, films, doodles, and writes poems about the lives of gals and pals. 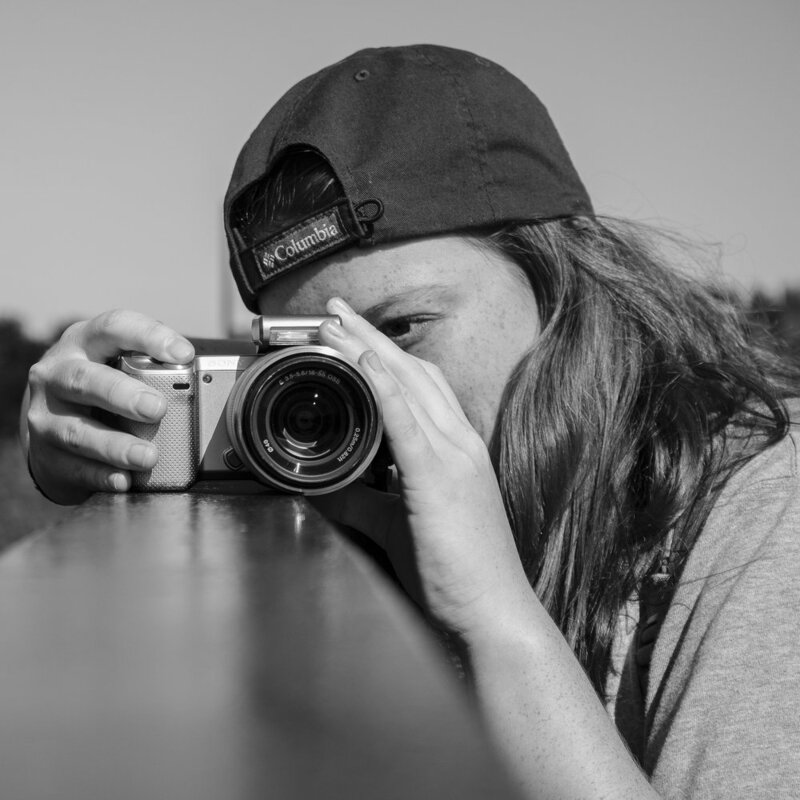 As a Bachelor of Fine Arts student at UWEC, Sarah works as a photographer and designer for NOTA, a literary and fine arts magazine. She also is a photographer for the Eaux Claires Music and Arts Festival, where she is reborn in creativity every summer.